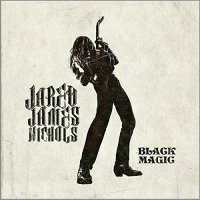 A Wisconsin born Blues/Rock guitarist, now based out of Los Angeles, it's probably fair to say that Jared James Nichols made quite a splash this side of the pond a couple of years back with his debut full-length release 'Old Glory And The Wild Revival'. Unashamedly seventies retro in its execution, the album saw Nichols channel everybody from Leslie West to Ted Nugent and Zakk Wylde; thumping, guitar-driven anthems carrying the day as the studio versions took on a whole new dimension on stage. A near constant presence on the European live circuit ever since (I first caught him with Glenn Hughes up in Holmfirth back in late 2015), his "take the music to the people"' attitude and obvious enthusiasm has really started to reap dividends in terms of market share... now it's time to prove '...Revival' wasn't just a one-shot deal as sophomore offering 'Black Magic' strains at the leash to be heard! The first thing you'll notice is the length of the album (or apparent lack thereof), the ten tracks enshrined within running to a shade under thirty minutes, making it seem more like an EP by today's oft ostentatious standards. That said, personally speaking, ten great tracks as opposed to fifteen (half of which are fillers) is better value in my book so I'm not about to pull the guy up on that score. Additionally, I understand his reasons for the short, sharp shock approach. Noticeably heavier and more intense than the debut, what really strikes home about '...Magic' is that this time around, Jared James Nichols and the boys have really nailed that moody, off the cuff live sound. You'll notice it as soon as the screaming wall of guitars that is 'Last Chance' kicks in, and even on less pacey numbers such as the southern fried 'Home' or the funky 'Honey Forgive Me', the sonic uplift hits you straight between the eyes... guitars set on stun, this is Rock 'n' Roll at its most primal. For a guy who wasn't even born when this sound was big news first time around, his take is not only authentic, it actually enhances it even further. Raw, raucous and soaked in heavy Blues guitars, 'Black Magic' is a worthy follow-up which will no doubt push his standing even higher.